A lovely soup that can be made into a meal. Wash, peel and boil potatoes in lightly salty water for 20 to 25 minutes, or until you can stick a fork in a potato with ease. Drain potatoes and transfer to a medium size bowl. Mash potatoes. Sprinkle a little salt and pepper. Add in the eggs one at a time, mixing in before adding the next. Sprinkle in one cup of flour. Kneed with you hand in the bowl then add in one more cup. If it is still sticky add in a 1/4 cup of flour. Form it into a ball. Cover with a clean towel and let rest for 30 minutes. Cut dough ball into four sections. Roll it into a log then cut that in half for easy handling. Dust a little flour on a clean surface. Gently roll dough out to 6 to 8 inch rope. Cut into 1 inch dumplings with a knife. Dust a little more flour so the dumplings won’t stick to each other. In a large stockpot, bring together chicken broth, shredded cooked chicken and roasted chicken base to a boil. Add dried parsley and black pepper. Drop in gnocchi one at a time making sure they are spaced out so they won’t stick together. Stir it every 10 dumplings. Bring it back to a boil for 5 minutes. 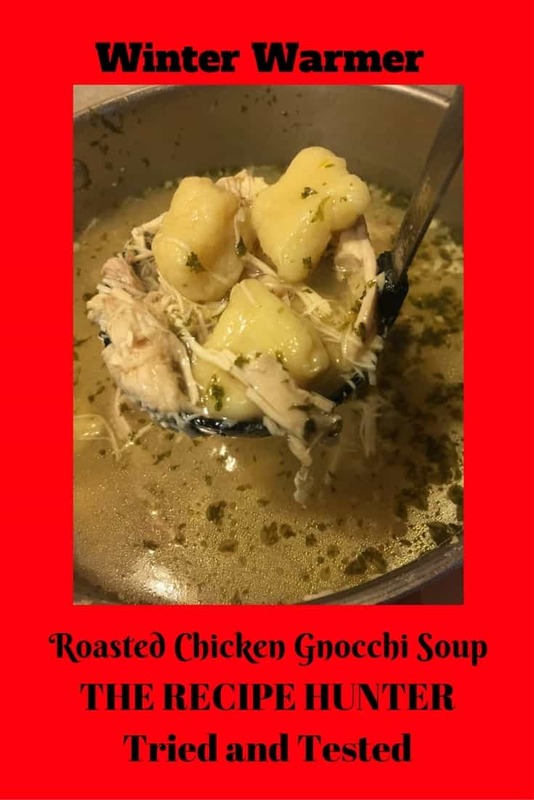 Do not let it boil for much long over the gnocchi will over cook and may fall apart. That’s not good eats. Let it cool for 5 minutes before consuming.